Tottenham may have suffered a painful Carabao Cup semi-final defeat to rivals Chelsea and followed that up with an FA Cup exit at Crystal Palace, but Mauricio Pochettino believes his side's last-gasp comeback win over Watford highlights the steely mentality he is forging in his squad. Goals from Heung-Min Son and Fernando Llorente in the final 10 minutes of the Premier League contest at Wembley on Wednesday turned defeat into victory and, coupled with slip-ups for Manchester City and Liverpool, moved Tottenham back into the title race picture. 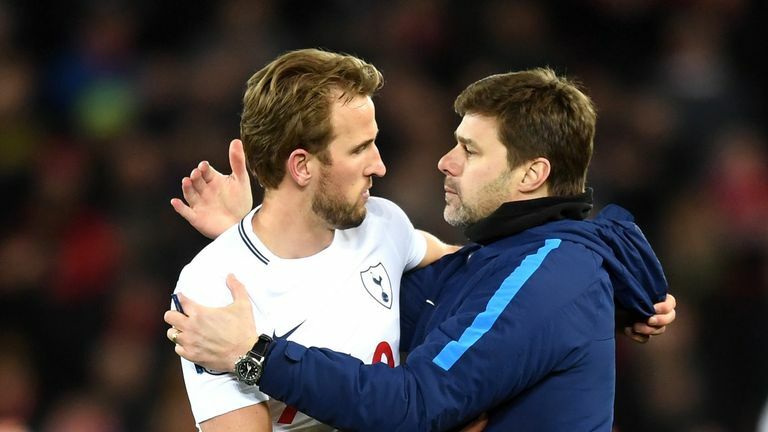 In the aftermath of last Thursday's penalty shootout loss at Chelsea and the subsequent setback at Selhurst Park, Tottenham's failure to convert four semi-finals and a League Cup final appearance into a trophy under Pochettino was used as a criticism of the squad's ability to deliver in the big moments. However, Pochettino, who has also seen his side score key late goals against Burnley and Fulham, as well as PSV and Inter Milan during an unlikely Champions League surge into the knockout phase, has no doubts about the mental strength of his players. "The mentality today is so strong and we're so happy to have that and created that," he tells Sky Sports at a snow-covered Tottenham training ground, ahead of their Sky Live clash with Newcastle on Saturday. "I think it was an amazing victory over Watford because, 10 minutes until the end, we created the possibility to turn the result. I think it was well deserved but I think maybe it's true the people can think 'without [injured] Harry Kane it is going to be difficult'. But [they should] talk very highly about the mentality and the quality of the squad. The mentality today is so strong and we're so happy to have that and created that. "For me football is about collective skills. You can miss some players but in the end you need everyone. And it's so important to keep the mentality [strong] with everyone." Pochettino argues the fine margins at the top level of the game can sometimes distort perceptions about a team. "It's difficult for the people to assess us, to be 100 per cent right," he says. "I accept that the perception sometimes can be different. But we can manage reality, we cannot manage perception. "Sometimes it is difficult because all that's measured is the result. If you win, you are the best - when maybe you're not the best. And when you lose, maybe you are the worst and maybe you are not the worst. "In football the line is so thin that it can turn one way or another and all is measured is that. Sometimes in football it is so unfair and the feeling isn't always nice. But you need to accept that because that is football and how today the people are thinking." Newcastle's shock win over Manchester City earlier this week was a case in point, with the defending Premier League champions losing 2-1, despite dominating the match. And Pochettino is fully aware that his side cannot afford to be below their best when they host Rafael Benitez's men this weekend. If they become too caught up in talk about the title race, they could easily be punished. "It's always important to stop the negative dynamic, so the victory over Watford was so important - but now you cannot stop because we are going to play Newcastle and it's going to be a very important game," he said. If we want to be there until the end, in a good position in the table, I think it's a must-win game. "Another three important points. If we want to be there until the end, in a good position in the table, I think it's a must-win game. "I talk very highly about the Premier League - every single club can win against another. One that was champion last season and is fighting for the title this season, it's possible they can be beaten by a team that is in the bottom. That is why the Premier League is the toughest competition in the world. "For us we are concerned about winning against Newcastle, and the next game and the next game. We will see what happens at the end of the season. If we're there, more than happy. If not it's because we cannot be there. But to think too much ahead is wrong. "We need to think about Newcastle, to be ready, about the circumstances to win the game. And that is going to put us in a very good position." While Kane continues his recovery from an ankle injury, Llorente will be given another chance to impress up front for Tottenham on Saturday. The Spaniard has had to wait in the wings behind Kane since joining in the summer of 2017 but Pochettino believes his winner against Watford will give him a much-needed lift. "I think it's a big boost for him and well deserved," said Pochettino. "He's been working hard and training and waiting for the opportunity behind a striker like Harry Kane, one of the best in the world, which is difficult and all the strikers need to build their confidence and to feel the net. "I think it is so important for him to feel so important. It's going to build his confidence and he's going to be an important player to help the team achieve what they want." Llorente's goals could indeed play a big part over the next month and into the business end of the season. But for Pochettino the key message for his squad for the remainder of the campaign is to maintain the strong mental attitude they have shown in bouncing back from adversity. "It's going to be tough, the second half [of the season]. Like always, it's a decisive moment," he says. "Maybe we are not arriving in our best moment because we have some injuries to key players but we are going to try. The determination is to win every single game and we're going to try. Always the attitude and the way you approach the situation is the most important thing. Always."